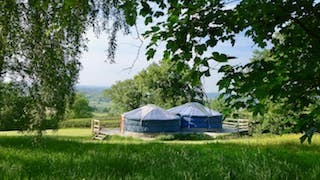 Stunning countryside, cosy yurts with woodburners and your own campfire. Glamping doesn’t get more relaxing. We are set in one of the most beautiful yet easily accessible parts of Wales. With three traditional Mongolian yurts and one custom built all-wooden yurt spread out across our site we offer a no stress, crowd-free yurt holiday. 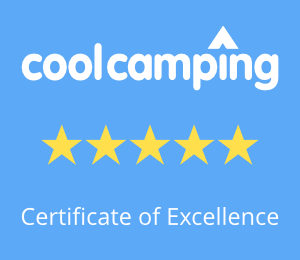 Our yurts and are set on raised wooden platforms and heated by a woodburner which makes them extremely warm and cosy even in the coldest weather. All of the yurts have electric lighting and standard electric points for charging phones etc. 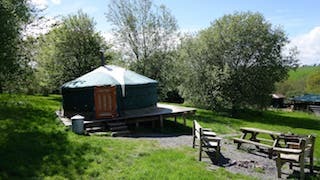 Our individual yurts are described briefly below. More detailed information can be found about each yurt page by clicking on the image. 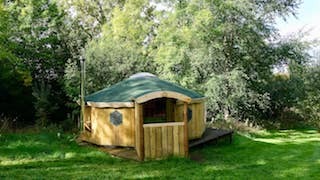 Our Ash Yurt has been hand built, on site, by local craftsmen to our own design and specification. 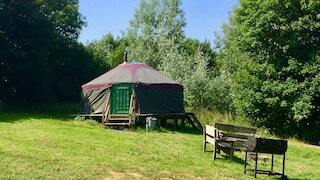 A traditional Mongolian 19ft yurt ideal for families, or two couples sharing. Our amazing Oak Yurt is huge and created by joining two yurts – like having adjoining rooms in a hotel. A beautiful traditional 16ft yurt. Perfectly cosy for couples or families with younger children. We don’t believe in hidden costs, or “add-ons” at Strawberry Skys Yurts. All of your firewood, kindling and firelighters are provided at no additional cost. Please see our “What to bring” page for more details on the essentials and nice-to-haves.